How Much Money Should You Be Saving and Are “They” Right? Saving Money 101: How Much Should You REALLY be Saving Each Month? Personal finance nerds will tell you to save as much as possible. Live in a box if you have to and achieve FI ASAP. The YOLO crowd, on the other hand, will say “Save??? What for?” Eat, drink and be merry, for tomorrow we die, right? Somewhere in between those two extremes lies the right answer for you. Here’s hoping the information we share today will help you find that answer. Saving money is important for a number a reasons. Let’s start by discussing the “whys” of saving. Although the average person might disagree, saving money is important. According to this recent Trading Economics article, the average savings rate in America in July of 2018 was 6.7%. This is a better number than we’ve seen in the past. However, is it enough? If you have an income of $50,000 per year, 6.7% equals $3,350 in savings each year. Whether that’s enough depends largely on you and your financial goals. Saving money is important for a number of reasons. Saving money will help you set a hedge against future expenses. For instance, saving money in an emergency fund will help you protect yourself against job loss. And against unexpected large expenses such as home repairs. Saving money for retirement will help ensure you can indeed retire. And it will help you have enough money to cover post-retirement expenses. Similarly, saving money for large purchases such as a car will help you stay out of debt. Can you save at least 20 percent down for your house purchase? If so, you’ll avoid having to pay private mortgage insurance. Private mortgage insurance can easily run $150-$200 a month. Not having that expense will make managing your budget much easier. And putting at least 20 percent down on your house will also help you protect yourself against a housing bubble burst like we had in 2007-08. Saving money is important because it gives you a hedge against the many financial unexpecteds that can come up in life. Start saving today to help protect you and your family. Having a plush savings account isn’t just for handling emergencies. You may want to start saving to create a better life for yourself. Saving money can help you achieve financial goals as well. Saving money isn’t just about protecting yourself against the bad. It’s about giving yourself a chance to experience the good in life. Maybe you have a dream of traveling the world. Or of retiring early and helping the less fortunate. Saving enough money will help you achieve those dreams. If you save enough you could spend a year living in another country such as Costa Rica. Or you could pay cash for a house. Money isn’t everything. However, it certainly makes life easier when you’re not struggling for it. Having a plush savings account helps guarantee money won’t be a struggle. But why is saving money so difficult? It seems like saving big money is left for the few. The rich. The $100k+ income earners. If he were here, Ronald Read would tell you differently. He spent his life working as a janitor and a gas station attendant. When he died at 92 he was worth over 8 million dollars. This Motley Fool story will show you how he did it. If a janitor can become rich, why can’t more of us regular Janes and Joes do the same? I believe there are a few prominent reasons saving money is elusive these days. See if you agree with me. Marketers and advertising companies have spent the last few decades conditioning us. They’ve worked to convince us that we “need” stuff. Or that our lives will be better with said stuff. The guys in the beer commercials are always surrounded by hot chicks in bikinis on a nice boat. Women with the “right” clothes, shoes, hair and makeup are automatically happy. In sending these messages, companies have convinced us that we need “stuff” to live well. What that “stuff” is doesn’t matter. Each of us falls prey to a different lure. Maybe it’s the new car lure. Or the $200 jeans lure. Whatever you think you can buy that will increase your joy. But the truth is that “stuff” only makes us happy for the short-term. Soon enough our new thing will become un-new. And we’ll want something else to replace the joy we felt when we first got it. It’s a cycle that will never end until you stop falling for the lie. Happiness comes from within, not from the outside. However, the lure of stuff isn’t the only nemesis to saving money. In many circles it’s not cool to not spend money. Depending on your friend or family circle, it might not be cool to save. People living the YOLO life want others along with them for the ride. After all, it’s more fun to spend with reckless abandon when someone’s doing it with you. If you want to increase your savings, find friends who have similar goals. The online personal finance blog world is wonderful for connecting with savers. Some might say they’re too focused on saving. And there has to be a balance. Life isn’t all about money – whether it’s saving it or spending it. If you’re abandoning all joy in life for the sake of a plush savings account that’s not good. Somewhere in your life there lies a balance. You’ll find the ability to save more yet not stop living life. So, exactly how much money should you be saving? You might be wondering exactly how much money you should be saving. The answer to that question depends on you and your financial goals. There’s no right or wrong answer to how much money you should save. Experts will give you target percentage amounts, and that’s okay. However, it’s your life and your financial goals at stake. You’re the only one that can decide how much money you should save. That being said, there are ways you can determine how much you should be saving. Consider starting by writing down your financial goals. What are they? An emergency fund with six months worth of expenses in it? A million dollars so you can retire early and live off the interest? Paying off your mortgage in five years? Whatever your financial goals are, write them down. Next, divide the amount of money you need by the number of months you want to have it in. Here’s an example. You’ll need to find $736 per month to reach your savings goals. Let’s do another example with bigger goals. Now you know you need to find $3,333 per month in your budget to go toward savings. If the savings number you’ve arrived at isn’t doable you’ll need to rethink your goals. Or you’ll need to find a way to bring in more money. You might find that your savings goals seem daunting. That okay. A bit of discomfort won’t hurt you. In fact, you might find that discomfort motivates you to reach your goals as soon as possible. But know that you’ll be going against the grain if you have big savings goals. We live in a culture that isn’t exactly keen on saving money. You may have to change your view about saving money. In other words, saving brings you peace and saving brings you joy. My emergency fund means I don’t have to worry about large expenses. My vacation fund means we get to go to Disney next year. And we won’t have a credit card bill waiting for us when we get home. WOW. Doesn’t that sound awesome? Start changing your view about saving money. Stop viewing it as a punishment. Instead, view it as a gateway to freedom and peace. If you’re not used to doing so, changing your view about saving will take some work. Psych yourself up. Retrain your mind so that saving becomes a good thing and not a roadblock to fun. Trust me: you’ll have a LOT more fun paying cash for a car than you will spending with reckless abandon. There won’t be any residual guilt. You’ll be at peace knowing you saved and planned for your purchase. Want to learn some ways to make saving easier? Try these tips. I’m the first to admit saving money can be hard. This can be especially true if you’ve never saved before. Or if you have a lower income. If you’re not into the habit of saving – or if you want to learn to save more – try these tips. 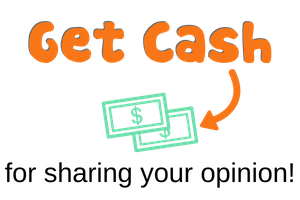 One great way to make saving money easier is to have your bank or employer automate it. Put your savings on a “set it and forget it” plan. If you never see the money in your checking account you’ll be less tempted to spend it. Just have it automatically deposited into savings. Then forget the savings account even exists. I’m telling you it works. And it’s an easy way to have your savings account grow without much effort on your part. This next tip is similar, but different. When you pay your electric bill you just send in the money and forget about it. You don’t sit and ponder about other things you could do with that $100. Treat your savings deposits the same way. Add them to your budget each month the same way you add other bills. None of those ideas are bad in and of themselves. Just don’t consider your savings account balance as you ponder acting on them. Remember: that money you put into savings, it’s gone. It’s the same as if you’d given it to your mortgage or utility company. The bill has been paid – forget about the money you used to pay it. Some people recommend opening a savings account at a different bank. Keep it separate from your checking account. For instance, you could put it in a high-yield online account. Do what you need to do to keep from withdrawing the money. After all, it is called a “savings” account. If you hadn’t planned on getting it, put that unexpected money straight to savings. Even if you had planned on getting it you can do that. For instance, take tax refunds. Maybe you know you’re getting money back from Uncle Sam. Make a plan to spend it in a way that allows for goals and fun stuff. For example, save 40%, put 40% toward debt and blow 20%. That way you’ll be able to have some fun with the refund, but also be able to work toward your financial goals. Another way to make saving money easier is to earn more money. If you’re finding it difficult to find money to save, consider earning more money. Here are some ideas for bringing more money into your life. 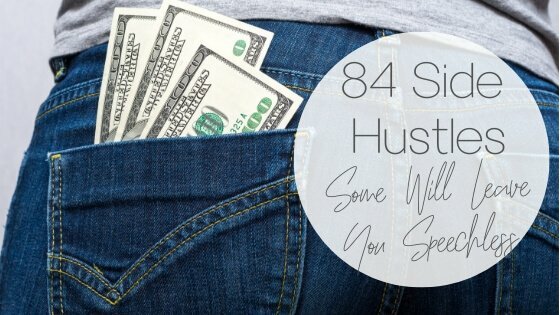 A side hustle is a business you can run in your spare time. Want some ideas for side hustles? Consider these examples. There are several types of work you could do from home as a freelancer. You could find graphic design gigs, writing gigs, editing gigs, data entry jobs and more. Or, you could work as a virtual assistant. It’s not uncommon to make thousands of dollars a month as a virtual assistant. Other ideas include blog/website design, working as a customer service rep and selling handmade crafts on sites like Etsy. Not interested in online work? Consider these ideas. If you like mowing lawns or shoveling snow, why not start a lawn care business? Advertise to people in your neighborhood via flyers. If you’re great at caring for others, why not start a babysitting business? Or a pet sitting business? You could start a dog walking business or poo scooper business too. One easy way to get started is to advertise your services on Care.com. Are you good at cleaning and organization? People pay good money to have help with house cleaning. You could schedule weekly or monthly jobs as needed for loved ones or neighbors. If organizing is your skill you could offer your services to people you know. Most homes have areas that need some organization. Advertise your services to help clients organize basements, office spaces or garages. 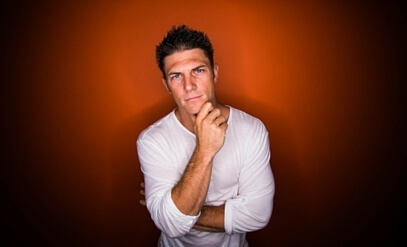 If you’re good at fixing things around the house why not start a handyman business? Charge on a per-hour basis for small home repair tasks, assembly tasks and more. There are so many ways you can earn more money. The ones mentioned here are just a few of the more common ideas. Make a list of your skills and talents and use the list to come up with ideas of services you can offer. Take all of the money you make, set aside 30% for takes and put the rest in savings. There are other ways to increase the amount of money you have to save. Why not cut expenses to have more money to save? You have many options for cutting back on expenses in order to save money. Try some of these ideas for cutting costs and put the extra money into your savings each month. How attached are you to your cable or satellite TV package? To your magazine subscriptions? Do you have a housekeeper or other services you could cancel? Or at least cut back on? Go through your budget to find services you can live without. Even if it’s only for a year or two. Salon trips and gym memberships are expensive. However, it’s important to take care of yourself too. Have you considered working out at home or outside when the weather is nice? Or doing your own manicures and pedicures? Maybe you could switch to a cheaper salon or gym. Look for ways you may be able to cut back on self-care expenses or eliminate them altogether. How much per month are you spending on groceries? On utilities and transportation? Would a little menu planning help you save money on groceries? Could you cut down on transportation costs by carpooling or taking the bus? Can you find cheaper car insurance rates? Get creative with your expenditures and try and scale back. 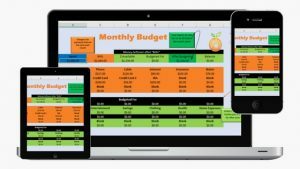 Go through every line item on your budget (you have a budget, right?). Work to reduce or eliminate each expense. Take the extra cash each month and put it straight into savings. Okay, we’ve covered several ways to help you save more money. But you might be wondering how you should decide on your savings rate if you’re facing serious debt. Here are some thoughts. It can be tough to think about saving money when you’ve got oodles of debt payments each month. But saving money is still important even when you’ve got debt. Check out these suggestions. Start automating your savings anyway – even if it’s just 1% of your income. Then move up from there. Make it 2%. Then 3%. Getting used to saving in small increments makes it easier to save bigger money. It might not feel like it, but in a way paying off debt is saving money. When you pay $500 on your credit card you’ve just increased your net worth by $500. Provided that all other numbers remain the same, that is. Each time you pay money toward debt you’re bettering your financial situation. You’re making it a little bit more secure, lowering your debt load, payments, etc. Give yourself credit where credit is due. Use the debt snowball method to eliminate payments as soon as possible. You’ll get to a point eventually where you can increase your savings rate. If you’re facing a lot of debt, consider transferring some or all of it to low/no interest credit cards. The less interest you pay each month, the faster you’ll pay off your debt. Look for good introductory credit card deals with no annual fee and a small or non-existent balance transfer fee. Paying off your debt should definitely be top priority when you’re thinking about savings. But having at least some money in savings is important too. Dave Ramsey recommends having $1,000 in savings before you start working on your debt snowball. This money helps cover unexpected expenses. That way you won’t have to resort to credit card usage if a small financial emergency arises. Now that you’ve started your savings account, where should you house it? And when can you use it? Consider these thoughts. What Do I Do with My Savings Money? So, you’ve started a savings plan. You’re putting at least some money into savings each money. Earned interest will help it grow. Before you decided where to put the money you need to determine its purpose. If it’s meant as an emergency fund it should stay in a no-risk account such as a high-interest bank savings account. Are you using it to reach long-term goals such as early retirement? Then you may want to consider higher risk investments for more growth potential. Talk to an investment expert for advice on how to invest the money. But if the savings are meant as a security blanket for your family, I advise against investing it. After your emergency fund has 6 months worth of expenses, then you can save to invest. Once your savings is in place, this next step is important. Only use the money for its intended purpose. You might find it tempting to buy something big once you’ve got $20k in the bank for emergencies. Don’t do it. You could end up with some serious buyer’s remorse. Use the money for what you intended it for. Then save more money if you want to buy or do something big. You’ll grow to like being covered financially for all of your future needs. It’s a peace that can only be understood once you have it. So, how much money are you saving these days? 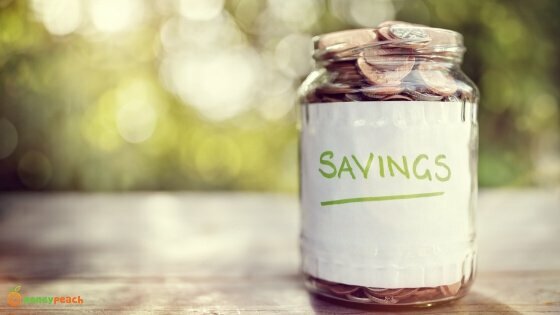 Did this article help you think of ways to save more? How do you find more money for saving? We’d love to hear your thoughts. Leave a comment for us! 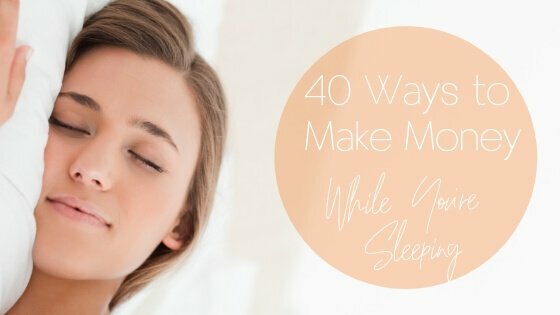 https://www.moneypeach.com/wp-content/uploads/2018/09/Blank-Photos-Test-560x315-6-1.jpg 315 560 Sara James https://www.moneypeach.com/wp-content/uploads/2016/06/moneypeachLOGOhomepage.png Sara James2018-10-03 06:53:332018-10-03 06:53:33Saving Money 101: How Much Should You REALLY be Saving Each Month? I heard a stat the other day that says that if you want to retire on a lifestyle that you’re accustomed to then you need to save 20% of your income over 35+ years. That’s a hell of a lot more than the 10% we often talk about within the blogosphere. Good to keep educating people to save more!